Most offer support by telephone and some of them provide support for people with particular experiences or circumstances – e.g. ectopic pregnancy, fertility problems, or recurrent miscarriage. Contact us for details. We also have a number of monthly support groups. 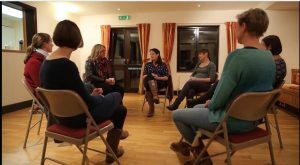 These offer an opportunity to meet with others who have experienced pregnancy loss, to share thoughts, feelings and experiences in a safe and supportive atmosphere. The thought of going to a support group can be daunting – but for many, it is actually a very positive experience. I was quite nervous of going and I was worried I might break down in front of a group of strangers. As it happened I found the session extremely helpful and I am really looking forward to going again. For anyone who’s anxious about going to a group, give it a try. You will be in a supportive environment, often a small group and you don’t have to share unless you’re ready to. Sometimes you realise more about your own feelings by listening to others. meets on request. Contact us for details. meets at Blackpool Sports Centre, Richmond Suite, Stanley Park, Blackpool from 6.30pm – 8pm on the 4th Wednesday of each month. You can text 07966 424046 or contact us for details. meets at the Alma Church, Clifton on the first Tuesday of every month, 7 to 9 p.m.. Further details on Facebook at Bristol Miscarriage Support. meets on the first Wednesday of each month from 6 to 9 p.m. at the Nurture Centre, Cambrian Place, John Street, Carmarthen SA31 1QG. Contact us for details and see also https://m.facebook.com/Carmarthenmiscarriagesupportgroup/. meets in the Sanctuary, New Victoria Hospital on the 1st Thursday of the month at 7.30 p.m..
runs as and when needed, so just let them know. Contact us for details. meets on the first Thursday of every month (from 7 June 2018) at the Mercure Hotel, Leeds Road, Wetherby, LS22 5HE, 6.30 to 8 p.m.. Contact aliszust@yahoo.com for more details. N.B. No meeting on Thurs 4 April 2019 due to illness. the London M.A. group meets once a month in Guy’s and St Thomas’ Education Centre, 75-79 York Road, Lambeth, London SE1 7NJ. Next meetings will be Thursdays: 29 November, and then in 2019, 17 January, 28 Feb, 21 March, 18 April, 16 May, 20 June. Contact MALondon2014@outlook.com for more information and directions. the West London group meets at Queen Charlotte’s hospital. The next meetings will be on Thursdays from 7 to 9 p.m. on: 4 April, 2 May, 6 June, 11 July (no meeting in August). The group meets in the Duke of Sussex room on the 2nd floor and will have signs near the entrance to direct you. For more information, please email miscarriagegroupqcch@gmail.com. meets on the first Tuesday of every month at Withington Methodist Church, Manchester M20 4AN, between 7.15 and 8.45 p.m.. Contact us if you’d like more details. meets on the second Thursday of every month from 6-8 p.m. at the Molineux centre, Molineux Street, Byker, Newcastle Upon Tyne, NE6 1SG. Contact us for details. pregnancy after loss group meets at the same venue on the 2nd Saturday of the month from 10.30 – 12.30.
meets on the first Thursday of the month from 7.30-9pm at St Mary’s Church rooms, London Road, King’s Worthy, SO23 7QL. Please note that there will be no meeting in April 2019. An additional group can be arranged as required for those who are pregnant after losing pregnancies. Please contact winchestermiscarriagesg@gmail.com for more details and directions for parking, as SATNAVs are not accurate. The Winchester support group features in a short film about recurrent miscarriage. • Contact us to get further details of your nearest support volunteer or group.